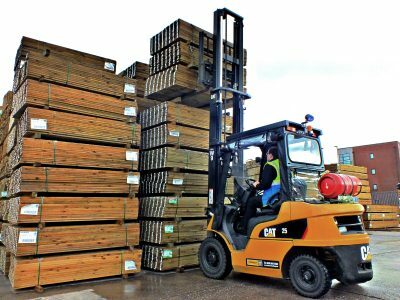 SCA Timber Supply contract with IMpact Handling for 23 forklifts. SCA Timber Supply UK has taken delivery of 23 new forklifts from materials handling specialist, Impact. The full-service contract hire deal includes a tailored five-year proactive maintenance agreement that will minimise downtime for its round-the-clock operation. The wood-based product specialist’s new in-house fleet comprises a dozen 2.5-tonne trucks, nine 3.5-tonne gas-powered Cat® lift trucks, a Hako sweeper and a single Combilift machine – showcasing the strength of Impact’s premium product range. It will collectively handle more than 200,000m3 of product across its 10-acre site each year. The Stoke-on-Trent-based business will also supplement its fleet with additional short-term hire equipment from Impact during peak periods of the year. Damon Hughes, General Manager at SCA Timber Supply UK’s Stoke site, says: “Impact only offers reliable equipment, and by tailoring our servicing agreement, the team helps us improve and manage forklift truck availability on a day-to-day basis. “Ever since we started working with them, they have helped us to identify where our performance can be improved and shown us the steps that need to be taken to ensure this happens. Impact regularly inspects all its equipment to spot potential faults before they become a problem, maintaining the performance of its customers’ fleets at the highest level. The materials handling specialist has also agreed to provide servicing and maintenance for SCA’s entire fleet, thereby maximising the performance and service life of every piece of equipment. SCA Timber Supply UK provides a range of timber and associated products to the UK’s home improvement and building materials sectors. The company’s headquarters boasts a warehousing capacity of 210,000 ft², and features a finishing mill with a 20,000m3 capacity planing line. It employs more than 100 members of staff.